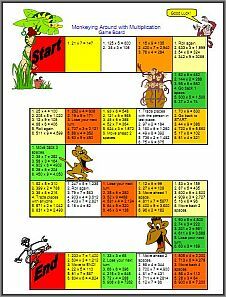 Multiplication Games For Kids are a fun way to build math skills. Multiplication games for kids are a big hit with students, parents, and teachers. For the average student, math can either be boring or difficult. Math multiplication games to the rescue! All players place their game piece on START. Players roll the die, and the person with the highest number begins the game. The first player rolls the die and moves forward that number of spaces. Then she reads the line that matches the number she rolled. If the line tells the player to do something (such as go back 2 spaces), the player follows the directions. If the line gives a math problem, the player writes the problem on her paper and solves it. For example, if the player rolled a two, she would move forward 2 spaces and solve 36 x 3 = 108. Then she tells if the answer on the game board is correct or incorrect. Someone else checks her answer with the calculator. If the player is correct, she stays on that space until her next turn. If she is incorrect, she goes back to the space where she began her turn, and that turn is over. Each player follows in the same manner. If your child or students are need to review some of the basic multiplication facts and are finding this game a bit too advanced, that's ok. You'll find more free multiplication games that will help them brush up on their time tables first! Of course multiplication and division go hand in hand! So if its a fun division game you're looking for...we've got that covered too. Here's a division facts game and then an activity for dividing 2 and 3-digit numbers. TRIANGLE FLASH: Here is a great classroom-inspired game to help your child learn number concepts in multiplication and division. All you need is some index cards, scissors and a marker. Ready. Lets Play! Click on link above. Multiplication games for kids really do take the fear and boredom out of learning math. Math is fun for kids if parents and teachers get creative in how it's presented. Multiplication Games For Kids Are Way Cool!